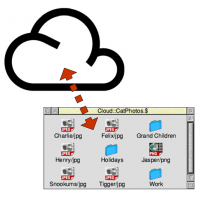 Grabs clouds, makes them available to RISC OS users. Elesar Ltd, the company behind the Titanium motherboard, has today introduced a new network filing system, called CloudFS, which is designed to enable RISC OS computers to access to cloud-based storage in an easy, RISC OS friendly way. The software integrates with OmniClient so that, when connected, the remote location appears on the left side of the icon bar just like any other drive – in much the same way that a connection to a shared folder on another computer on your home network, or on a network attached storage device, appears. Once logged in, therefore, files can be copied (or moved) to or from the remote location using standard RISC OS drag and drop operations – and CloudFS also provides star commands so that filer operations can be carried out at the command line. Computers running operating systems such as Linux, Windows, MacOS, Android, or iOS, are all capable of accessing cloud-based storage solutions, usually by installing software supplied by the cloud-provider, so once you have put any files “in the cloud” you should be able to set up access to them from any of those operating systems – and from any location, provided you have an internet connection. It should be noted, however, that there is a fundamental difference between the way CloudFS on RISC OS works, compared with typical cloud-storage solutions on the other platforms: On those other platforms, you would normally save your files locally, to a particular folder on your hard drive, which the software supplied by the cloud-provider then synchronises with your space on their servers. CloudFS, on the other hand, does not do that – by presenting the remote location as another drive, files are effectively handled ‘live’. However, it may be possible to use a synchronised approach – see the panel below. There is currently only one officially supported cloud storage provider, Switzerland-based pCloud, but the software has been designed so that support can be added in future for other cloud service providers – though the addition of support for other providers depends on whether or not there is demand for them, as well as whether or not their protocol specifications are easily available. pCloud offers a range of price plans – and like many such providers, that range includes the option of a limited amount of space for free. In this case it’s currently 10GB of storage space, which can be increased to 20GB by inviting others to sign up with them as well. Current paid for options include 500GB and two terabytes for a small monthly fee. Thank you for contacting us. You’re either not registered to open support requests, or the ticket number in the subject line was not recognised – perhaps it’s mistyped? Okay, let’s try again, using a different email address. I got a reply from Rob Sprowson to my second attempt, pointing me at pCloud’s page about security and explaining that “The security is all done at the server end, which is one of the reasons why I prioritised pCloud over other providers.” In other words, that the connection itself is secure – which isn’t actually what I meant, but is itself an important point. pCloud uses TLS/SSL encryption for the connection (and transfer) between your RISC OS computer and pCloud’s servers. Rob then went on to explain that seamlessly encrypting the files, so that they are stored remotely in an encrypted form to which only the user has the key, is not currently supported by CloudFS. pCloud does provide an add-on to their service, in the form of pCloud Crypto, which costs a small monthly fee and allows users to “protect their confidential files with high-end security” – but since that means using their software, it’s not an option for RISC OS users; they could run it on their PCs, but not on RISC OS. However, as with CloudFS being ‘live’ access rather than synchronised, there may be ways around this – again, see the panel below. CloudFS is priced at £28.80 including VAT, plus postage – which, as noted above, includes the option to sign up for pCloud’s free 10GB offering at the checkout stage. It is suitable for any computer running RISC OS 3.70 and above with version 5.00 of the Internet module. Although CloudFS presents the remote storage location as a live filing system, this does present a significant disadvantage over the synchronisation approach used on other platforms: If you lose your connection to the internet, or the cloud provider is in some way inaccessible, you can no longer access the files stored on their servers. When the files are synchronised, however, you still have access to the latest versions of any files that are on the computer you are using. With some thought, therefore, it might be possible to set it up so that it is synchronised with a local directory, though not quite as seamlessly as it would be on other platforms. The way to do this would be to use software such as SyncDiscs or DirSync – if either can synchronise to drives on your local network, accessed using OmniClient/LanManFS (which I would expect), then it should be possible to synchronise with a remote, cloud-based location using CloudFS as well. While CloudFS doesn’t directly support encryption, there is nothing to stop you from encrypting any files you wish to upload yourself, before saving them to the remote location. This can be done with Q-Lock from Dr. Nat Queen – but note that the software is designed to not only create encrypted versions of any files fed to it, but also to thoroughly remove any trace of the unencrypted source files. If you want to retain unencrypted local copies of any files, therefore, you must ensure that what you give to Q-Lock to encrypt isn’t the only copy. Note also, that just as when using something like pCloud Crypto on another platform resulting in files that can’t be decrypted on RISC OS (in a meaningful way), it’s possible that files encrypted with Q-Lock can’t be easily decrypted (in a meaningful way) on other platforms; not being a user of this software, I quite simply don’t know. In both cases, the methods of encryption are widely known, so decryption should be theoretically possible, but whether it is practical do to so, and whether the results will be usable files, is another matter.